112 Pages A4 format. Black and white. 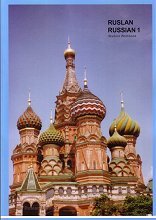 203 practice exercises for learners to reinforce the material in Lessons 1-10 of Ruslan Russian 1, as well as the alphabet introduction. Each section includes listening exercises with free online audio. Alternatively, there is a CD which is available separately. There are a large number of black and white photos linked to the exercises.